In Part 1, we discussed your reactions to losing a parent. 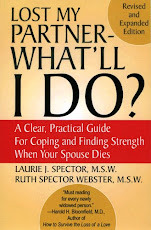 Our excerpt from Lost My Partner – What’ll I Do? continues. As you attempt to cope with your own feelings, you may find that your relationship with your surviving parent changes in other ways. In addition to helping with funeral arrangements, you may be called on to assist your already overwhelmed parent deal with health and/or financial problems. Under these circumstances, your mom or dad can seem uncharacteristically dependent and clinging. They may also have expectations of you that can feel burdensome or inappropriate. Trying to manage all of the above in addition to your own family and work demands can stir of flashes of anger and resentment, which you may feel guilty about. - Everyone grieves in their own way and in their own time. Each member of your family had a unique relationship and history with your late parent and their reactions to the loss will often reflect this. - Respect the fact that the mourning process (yours as well as your parent’s) is difficult and takes time. - Although mom or dad appears overwhelmed and not their usual self, this is temporary. She/he is an adult and still your parent. While some assistance is appreciated, mom or dad does not want to be treated like a child. Most surviving parents worry about becoming burdens to their children even under these temporary circumstances and don’t wish to relinquish their customary role in your life as providers of love and support. Learn more ways to cope in Part 3.